In Visual MODFLOW Flex, the Initial Heads are defined at the stage of Defining the Properties. For more details, please see the section on setting Initial Heads in the Define Properties workflow step. •Use Specified Heads - will use the values that are defined for “Initial Heads” at the Define Properties step. •Use Ground Elevation - will use the elevation values for the top of Layer 1. •Use Previous MODFLOW Run - requires you to select a .HDS file from a previous MODFLOW Run and specify the Time step to be used. Warning: The selected .HDS file cannot be the same as the .HDS file in the current translation directory. 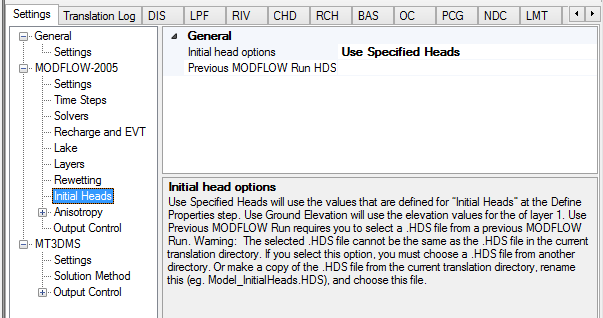 If you select Use .HDS from Previous MODFLOW Run option, you must choose a .HDS file from another directory.